Multi Pack 2 is about as powerful as analysis plugins get, though it might be overkill for some. Multichannel operation. Flexible response settings. Difference analysis. Multi-pane views. Easy zooming. Initial setup is fiddly. Complexity not suited to everyone. 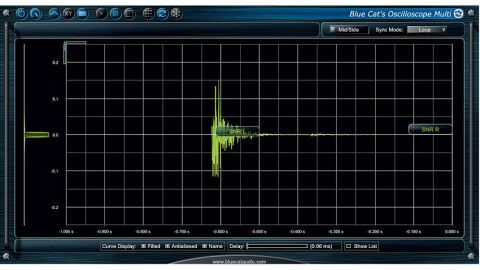 Blue Cat Audio's Multi Pack is a three-plugin bundle of analysis tools, comprising FreqAnalyst Multi, StereoScope Multi and Oscilloscope Multi. The 'Multi' in the name points out that the plugins (VST/AU/RTAS/AAX/ DirectX) can be used on multiple tracks as well as single ones, making concurrent analysis of up to 16 sources visible within one window. Version 2 adds a brand new multi-pane window setup, AAX support and assorted other refinements. "Functionality is split across three plugins, which keeps things simpler than rolling it all into one"
As we've noted, functionality is split across three plugins, which keeps things simpler than rolling it all into one. All three share roughly the same window layout, with many options along the top bar, the main display in the middle, curve selection to the right (in a foldaway panel) and curve behaviour at the bottom (ditto). The windows can be set to three sizes and have multi-pane options to match their respective displays (see below). The displays can be zoomed using the bars at the top left or using 'lasso' mouse selection, and the curves can be renamed, antialiased and filled for visual clarity. Settings can be 'pushed' from one plugin to others of the same type - you get four static curve memories per instance (as well as cross-plugin global 'freeze'), and pretty extensive MIDI parameter control onboard. "FreqAnalyst is the most complex of the three plugins, operating in mono, stereo or mid-side mode"
FreqAnalyst is the most complex of the three plugins, operating in mono, stereo or mid-side mode. It features two panes: a typical frequency spectrum curve, and a signal difference analysis. You can switch between panes or view them together, side-by-side or stacked vertically. There are three fundamental analysis types (Instant, Peak and Average), but rather than select these globally, they're assigned in the routing page on a curve-by-curve basis. Back in the main screen, you can then use the array of controls to adjust the precision, speed, frequency, envelope follower (attack, release and peak reset), threshold and offset (level and slope) of the analyser. The Oscilloscope offers two main panes (Time and XY) and can operate in stereo or mid- side format. Time mode centres on a real-time waveform window with three view modes (Flow, Loop and Trigger), and a histogram to the left. XY mode enables the plotting of up to two pairs of sources on perpendicular axes - for example, the left and right of a stereo signal for viewing and checking phase coherence. Finally, the Stereoscope. This stereo-only analyser has two panes (Stereo Image and Difference) and, like FreqAnalyst, includes three fundamental analysis modes: Instant, Peak and Average. You also get a number of overall curve parameters to adjust precision, envelope (Attack, Release, Peak reset), threshold and gain. The basic concept of Multi Pack 2 is one of maximum flexibility and freedom. So, if you just want to strap one of the meters across your stereo track, rather frustratingly, the default settings have no curve assignments and you won't actually see anything happen in the display. Thankfully, there's a library of categorised presets included (Analysis Settings, Layout, Names and Routings), and once you've got a starter setup you're happy with, it would be wise to overwrite the default preset. "There's plenty to like, including the very quick mouse-based zooming (a right-click zooms back out), useful window sizing and folding away of unwanted panels"
It's also worth mentioning labelling. If you've only got one plugin instance running, it's not necessary, but once you have more than one analyser of the same type loaded, it can be hard to figure out which channel a plugin belongs to. With the routings of other instances shown in the Curves list, naming them certainly helps make sense of everything. There's plenty to like about Multi Pack 2, including the very quick mouse-based zooming (a right-click zooms back out), useful window sizing and folding away of unwanted panels. Where available, the Average and Peak analysis types, combined with the various curve settings, enable everything from high-resolution, pinpoint-accurate, frantic (and CPU-draining) peak-style results, to smoother, slower and arguably more helpful 'average' curves. In the Oscilloscope, we're impressed by the 'freeze frame' style of the Sample setting, as well as the more fancy- dancing Lissajous type XY display. Initially, we found the Stereoscope a little confusing, but then realised that the more stereo the signal is, the flatter the curve. We like the option to contrast 'how stereo' two separate signals are, using the Difference page. However, it's the multitrack functionality that's undoubtedly the headliner, particularly the ability to assign different types of curve response to different sources. Plus, in terms of workflow, the ability to 'push' all or individual settings to all loaded plugins of one type makes the setup process less laborious. Blue Cat has made a name for itself producing precise, detailed plugins, and these three fall squarely into that category. At times, the learning curve is steep, but it's richly rewarded, and version 2 certainly improves the user experience. While we're giving them a big thumbs up, these plugins go way beyond what you would consider 'standard issue', which is something to bear in mind if all you really need is the basics.